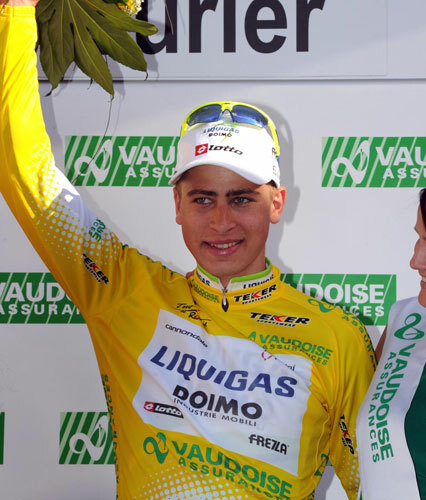 Peter Sagan (Liquigas-Doimo) out-paced his rivals to take the bunch finish at the end of the stage one of the 2010 Tour de Romandie in Switzerland on Wednesday. The 20-year-old Slovak added the Romandie stage win to two Paris-Nice stages won in similar fashion in March. Italian Francesco Gavazzi (Lampre-Farnese Vini) placed second, with Irishman Nicolas Roche (Ag2r-La Mondiale) in third. Britain’s Ben Swift (Team Sky) came home in ninth. Mark Cavendish (HTC-Columbia) lost touch with the peloton on the second category Cote aux Fees, and could not regain contact with the group, ruling him out of the bunch finish. The day’s racing was largely dominated by a three-man break consisting of Thibaut Pinot (Francaise des Jeux), Chad Beyer (BMC Racing Team) and Andrey Zeits (Astana). Pinot dispensed his two companions on the Cote aux Fees to go solo. Before Pinot was reeled in by the bunch lead by Liquigas and Lampre, Briton Charly Wegelius (Omega Pharma-Lotto) had a spirited yet ultimately unsuccessful attempt to bridge up to the lone escapee. At 18km to the finish, Jan Bakelants (Omega Pharma-Lotto) had a solo dig, managing to evade the rapdily descending bunch until 4km to go, bringing it all back together for a sprint showdown. After placing second in the opening prologue on Tuesday, just one second behind winner Marco Pinotti (HTC-Columbia), Sagan comfortably moved into the leader’s jersey thanks to the 10-second winner’s time bonus. Britain’s Chris Froome (Team Sky) failed to start the stage due to injuries sustained when he crashed on the final corner of the opening prologue. Froome will now attempt to recuperate prior to starting the Giro d’Italia next weekend (May 8). 10. Stefan Denifl (Aut) Cervelo all same time.